Just inside North Square, at Richmond and North Street, is the home of Paul Revere. It is a wooden house, with a projecting second story. Revere lived there during the 1770s, and owned the house until 1800. The building has been restored to how it appeared when Paul Revere lived there with his family. "The house was built soon after the great fire of 1676. Its predecessor on the same spot was the parsonage of the Second Church, bought for the use of Increase Mather by the trustees, in 1670, of Anthony Checkley, who had built it on land purchased of Bartholomew Barnard and Richard Martyn. Mather had accumulated here a fine library, numbering over a thousand volumes, most of which were saved from the fire. To repair the loss of those that were burned he was generously requested by Madam Bridget Hoar to take such books as he pleased from the library of her deceased husband, Leonard Hoar, who had been president of Harvard College. The first person to occupy this house for any length of time was Robert Howard, who bought it in 1681 of Daniel Turell and Thomas Walker. Howard's daughter, Sarah Wyborne, sold it in 1741 to Captain Andrew Knox, who mortgaged it to John Erving. In consequence of the non-payment of dues, Erving took possession in 1763, and held it as a tenement till 1770, when he sold it to Paul Revere for £213 6s. 8d., taking a mortgage of £160, which was redeemed in good time. It is possible that Revere lived here some years before he bought the house. We know that he lived here thirty years after he bought it, and then moved into the larger house which he purchased in Charter Street Jonathan Merry bought the old place in 1800, and sold it again soon after to John Loring, whose family have held it until recently [c.1860s]. 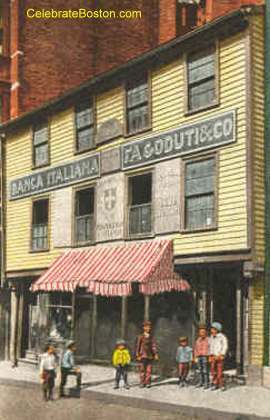 For many years it was known among seamen as a well-kept American boarding house, patronized largely by men from the Cape, who in so many instances became captains of the best ships sailing out of Boston. The chief interest connected with this ancient house is the fact that during the most eventful period in our history it was the residence of the distinguished patriot whose achievements in the cause of liberty are so widely known." 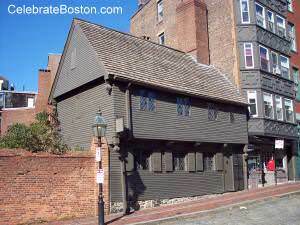 On March 5th 1771, on the first anniversary of the Boston Massacre, Paul Revere displayed objects in the windows of this house, observing the solemn occasion. Many spectators crowded into the square. The mood was silent with the expressions on people's faces that that of gloom. The north window contained a figure of the Genius of Liberty, holding a liberty cap. Under her foot was a soldier hugging a serpent, which was the emblem of military tyranny. The center window contained a printed view of the Boston Massacre. The south window contained an obelisk with the names of the five victims of the Massacre, in front of which was a bust of Christopher Snider. Snider was a school-boy, and had lost his life by a shot fired into a crowd at random by Ebenezer Richardson, two weeks before the Massacre. Behind the bust was a figure representing Snider's ghost, as he stood when he received the fatal wound, with the inscription below: "Snider’s pale ghost fresh bleeding stands, and vengeance for his death demands." The following is another description of this event from Rambles in Old Boston: "The first anniversary of the Massacre was a day of profound solemnity in Boston. All the bells in town were muffled and tolled. Early in the evening a crowd assembled in North Square, in front of Revere's house, to see the transparent paintings, which he had prepared, illustrating the event. There were then three windows in the second story. In the one on the right sat the genius of America, holding in her left hand the cap of liberty erect on a staff, and trampling under foot a grenadier who was grasping a serpent, the emblem of tyranny. With her right hand she pointed to the massacre, which was vividly portrayed in the middle window. The remaining transparency contained an obelisk, bearing in front the bust of young Snider, and on the pedestal the names of the five persons who were killed in the tragedy. Snider's ghost was finely drawn in the background, with a group of friends standing near by weeping. The effect of this exhibition upon the spectators is said to have been deep and lasting. The old house was probably never looked at so intently and by so many eyes as on that memorable evening." Paul Revere's Ride is described in the Old North Church page. Elijah Sanderson was a Patriot that was captured at Concord during Revere's Midnight Ride.